I’m back with another fun, easy cocktail recipe! 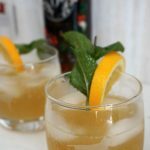 A few weeks ago I shared recipes for some summer fruit whiskey smash drinks, which were delicious. But the cocktail creations don’t stop there. This time, I experimented with vodka—which I usually don’t go for—and a ginger liqueur called Big O. It’s in the same portfolio as the JW Kelly & Co. bourbon I used before, so I knew I would like it. There’s a funny story behind the inspiration for this cocktail. Mom, I apologize in advance. One weekend back in college, a few friends and I decided to stay in and entertain ourselves rather than go out. We had a motley assortment of cheap liquors and mixers, as it often goes with broke college students… rum, ginger ale, orange juice, something fruity, some kind of bourbon, and naturally, Burnett’s vanilla vodka. I know, I know, insert vomit noises and judgment here. As the night went on, we became somewhat confident in our mixology and started crafting our own concoctions. One such concoction was Burnett’s vanilla vodka, orange juice and ginger ale. Doesn’t sound too bad, right? And that night, at that point, it was delicious. The following weekend, I tried to recreate said concoction, to see if it was really as good as I remembered. Well, it certainly was not. I spit it out and passed off the Burnett’s to another friend. To this day, I still get a little nauseous when I see Burnett’s vanilla on the shelf at my local liquor store. I was surprised at how light the Big O liqueur is. It has plenty of ginger zing, but it wasn’t overly spicy, or overly sweet. I can’t wait to try it in more cocktails, and even in some savory cooking. 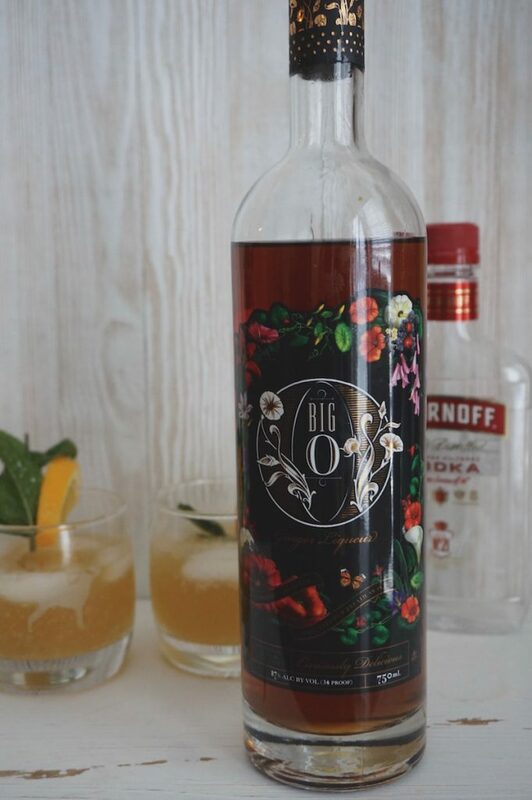 When I first got a bottle of the Big O ginger liqueur, I immediately thought back to that night and that awful “cocktail.” But this time, I was determined to make it better, the way it should’ve been made the first time. Using fresh ingredients and better quality liquor and liqueur did the trick, and this is one of the better cocktails I’ve made this summer. Also, look at how pretty that label design is! 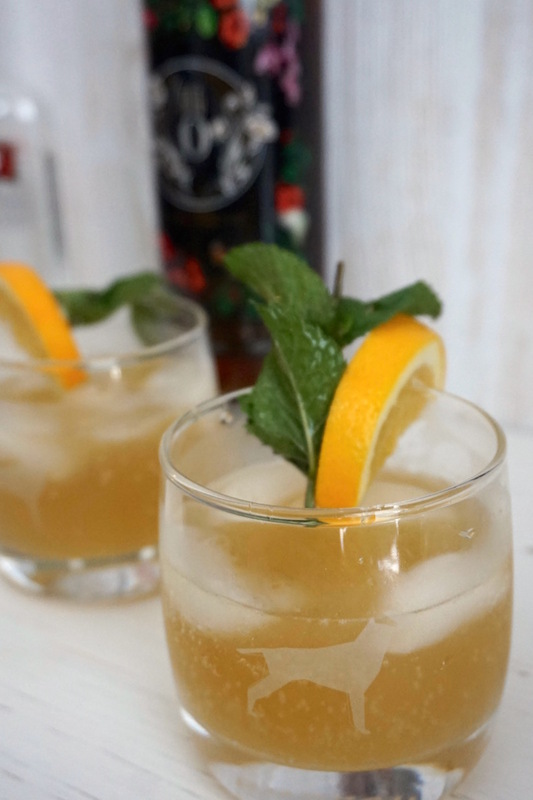 It’s really easy to whip up this cocktail in just a few minutes. The recipe also easily doubles or triples to make a bigger batch to share with friends. You can also adjust the orange and lime juice proportions to fit your tastes better! Add all ingredients (sans ginger ale and mint) to a cocktail shaker or mason jar. Shake to combine for 15-20 seconds. Strain over ice into two glasses. Top with club soda or ginger ale. Garnish with fresh mint if desired. This is definitely a much better version of that “cocktail” my friends and I made in college. It’s amazing what a difference fresh, quality ingredients can make. 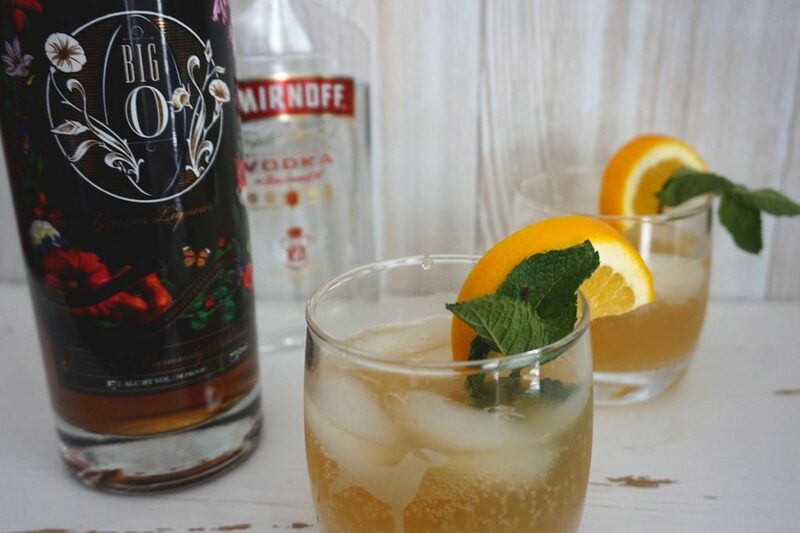 Learn more about Big O Ginger Liqueur on their website—including recipes and where to buy it near you. What tasty cocktails are you crafting up this week? A Thought and a Half is a participant in some affiliate programs. Affiliate programs are designed to provide a means to earn fees based on clicks and purchases on affiliated sites, at no cost to you. Read my full disclosure statement here.